Th-INK-ing of You: ODBD 5th Anniversary Release Blog Hop! ODBD 5th Anniversary Release Blog Hop! Hello everyone! Welcome to the Our Daily Bread designs 5th Anniversary Release Hop! Each year, Kelley allows each of her design team members to submit a Scripture Verse, a sentiment or a quote, and those submissions are made into the Anniversary sets. Today's hop will show most of those submissions, and we truly hope you love them as much as we do! If you got here from Angie's Absolutely Amazing Blog, you are in the right place! If not, why not start at the ODBD Blog and hop from there? To qualify for one of these prizes, simply hop to each designer, leave a comment and return to the ODBD blog to let us know you finished the hop, if you had any problems along the way, and most of all, leave your congratulations on this big milestone for Kelley and Rick! I submitted Heb. 13:5B.. Never will I leave you, Never will I forsake you. I always try to think of verses that will be comforting, uplifting, encouraging or in some way say just the right thing to the person I'm sending a card to, and this verse often comes to mind. I'm so excited to have it in a stamp now for all those times it's needed! This verse is in Scripture Collection 10, shown below. I heat embossed my sentiment with fine detail silver embossing powder. I cut it out with a Spellbinders Antique Frames & Accents, and matted that on alternating brushed silver and white layers cut with Spellbinders Resplendent rectangles. On 2 layers I lightly sponged pink ink and I added tiny little pink silk roses from ZVA Creative. I didn't feel anything else was needed... no bows, no pearls.... just the little flowers surrounding a wonderful verse! Thanks so much for stopping by, and now I will send you on to our Sweet Sabrina, where I know you will be wowed! Oh My Stars!!! Grace this is GORGEOUS!!!! Absolutely breath taking!!!! Super gorgeous, Grace! I love the gray and pink color combo and the die cuts are super elegant!! Love it!! HUGS!!! So gracious Grace love this and your back ground music sets this all. Oh how gorgeous Grace!! I just love the framing with the dies, your layering and the added flowers. LOVE that verse!!! Miss you dear friend. Hope you are enjoying your time with Lauren!! Gasp!!! Grace, this is a true masterpiece. The sentiment is so special, and it's truly brought to life with the soft and delicate flowers and dies that frame it. Gorgeous! oh, be still my heart... this is so gorgeous, Grace!! and a beautiful verse for so many occasions! What gorgeous layers of beauty! I love the dimension, soft pink and lovely design!!! luv this scripture, it is a comfort for me at this time...your card is gorgeous Grace, hope you have a wonderful weekend! Wowza Grace! This is gorgeous. I love the pink roses. I also love these spellbinder dies. Very nice! Love the detail! Grace this is simply gorgeous! Love the verse, and the pink and silver look wonderful together! Stunning! TFS God bless!! Oh my! Beautiful! Love all the die cut work and layers. Blessings! Another stunning card, Grace! Love the soft pink touches around the edges of the gorgeous dies, and who can resist pink roses? 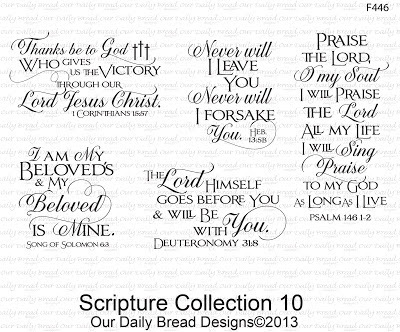 Love your choice of scripture for the anniversary set! 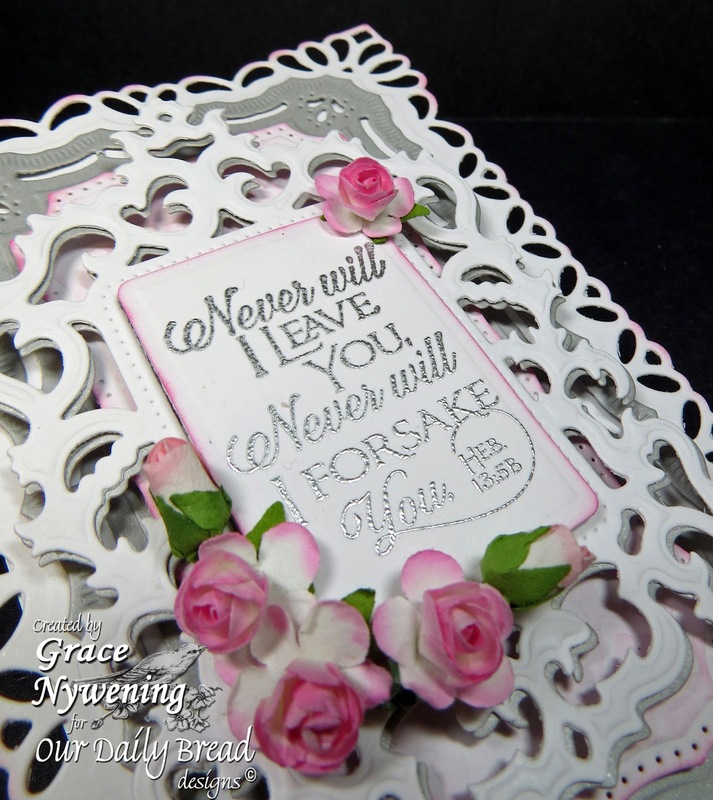 Gorgeous card, Grace!Love the new scripture collection and how beautifully you've showcased this one scripture in intricate die cut panels and soft pastels!! Wonderful card, you do great work! Grace, this is just stunning! The beautiful spellbinders, the roses! And the sentiment - just stunning. I love the comfort of that verse. Your use of intricate layers is excellent! Wow!! Your card is just beautiful!!! Thank you for sharing it with us!!! What a beautiful card. Delicate and uplifting with the perfect scripture. This is absolutely stunning!! Love everything - the layers, the colors and the sentment is beautiful. I'm going to have to get this stamp set. I love this verse and you are right it can be used quite often! Your card is gorgeous. Love all those dies and the tiny roses frame the verse perfectly!! Just a gorgeous card, love the layers and the sentiment is perfect. Wonderful verse, great layering of the dies, and such lovely flowers to compliment it! Such beautiful dies for layering. Also the pink distressing is so pretty. Grace, what can I say. Your card is absolutely beautiful. Gorgeous, Grace! Such a wonderful color combo and fab framing. Beautiful card! Love the layering and the shape of the card! Gorgeous card! Love the color combo! Thanks for sharing! Gorgeous card, Grace. Love all the layers, the scripture verse, & the color combo. Love the colours you've used on such a pretty card. Thanks for sharing. What a stunningly beautiful card. I love the inking of the edges and the flowers. Thanks for the inspiration. Gorgeous card love the layering of the dies and the Verse thanks for sharing. That is such a pretty card..love the various layers and uplifting bible verse. Lovely card; thank you for sharing! Grace, you're beautiful creations always leave me speechless! This is absolutely stunning! WOW! Your card is gorgeous! The recipient of this card is bound to be speechless - it is so beautiful! I have this die on order, so I am having die envy as I look at this. Love the touch of pink with the flowers. So many great sentiments in this set, but I love your choice...He is always there. A beautiful card Grace. Elegant & Gorgeous! Love the sentiment & dies! Grace, this left me speechless. Between the beauty of your card, the music playing on your blog, and your clear love of the Lord, this brought me near tears. Thanks for sharing-I am so glad you chose this verse; I will definitely be purchasing it when ODBD comes to St Louis next month for a scrapbook convention! Stunning. Love the frames you used. You never cease to amaze with your cards. I love looking at what you create. The use of the layered frames really sets this one off. Grace, this is beautiful! With just yours and Angie's, simplicity is speaking volumes. Thank you! Will it continue with the other designer's? Blessings to you! love all of your layers and subtle shading. beautiful card. No, nothing else is needed for your card, it is perfect! Just lovely! The frame sets off the design perfectly. Absolutely fantastic. I love everything about it. Ooohhh . . . how gorgeous!! This is so elegant with those fancy dies. Love it! Love your scripture. Your card design invokes the promise of fidelity. A marriage of delicate frames & flowers with a steely backdrop. Love it. Grace - I have no words for the beautiful creation. It is so perfect in every way. Also love the verse you chose - thanks so much for sharing. Gorgeous! Really love the verses in this set! So intricate and delicate. Beautiful! Your card leaves me speechless... it's beautiful. Thank you for sharing. I have those spellbinders, they perfectly display this verse. Nice card. beautiful card Grace...I love the new sentiments!! GASP!!! Love this card. Love the mix the dies and any kind of heat embossing is always awesome!!! Wow, what a exquisite card. I truly love everything about it. I love how you embossed the phrase, just love it. This is gorgeous Grace! Love all the frilly edges and the beautiful Scripture. Love the focus on God's Word. Nicely done. So delicate and pretty! I love the sentiment! Such a stunning way to share such a beautiful promise! THAT is one of my favorite verses!! I quote it often when it is truly needed and I refer to it for myself when I'm feeling a little glum (handicapped/disabled). The card itself? FANTASTIC!! Simple design, clean and the roses are perfect! Thank you so much for sharing this card! How beatiful, Grace! Love the pink and gray combination,and the lacy edging makes it so beautiful. Love the music praising our Lord and Savior!! You nailed beauty with this card. All the dies are perfectly matched up putting this together. A stroke of genius in using the gray card stock in the back. Very inspiring and beautiful with the verse that could move mountains of fear in a life. Very pretty card. Love the die cut layers and of course the verse. Great job. Absolutely stunning Grace (as are all your creations!) I enjoyed your soft music in the background while looking at this gorgeous creation in further detail! Grace, as always, your card is absolutely stunning and inspirational! WOW! This card took my breath away! It is absolutely gorgeous! Grace, this is stunning. Love all the layers and just the hint of pink. You were right to stop with just the little flowers. Perfect!! So much detail, very nice. Oh the layering on this is just lovely! The verse is such a great one too. 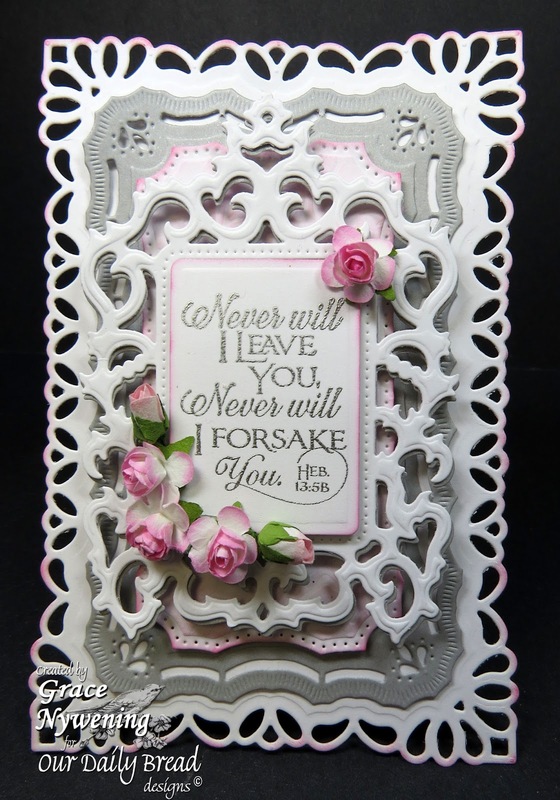 What a beautiful ornate card - all those diecut layers are fabulous, but the encouraging verse still has centre stage! Such beautiful dies...love the pink and grey combo....yes my socks are officially knock off!!!!!!! Grace, this is a work of art that really needs framing! Beautifully done and the scripture is one of my favorites! Grace - This is one I would hang on my wall where I see it first thing every morning. Your design is beautiful and the Hebrews verse is one of the best and most comforting promises that we have in Christ Jesus! Love the scripture, love the card. Thanks for the inspiration. For the Love of Crosses Blog Hop! For the Love of Wood Anniversary Hop! ODBD Anniversary Customer Linky Party! Mar 1 Release Blog Hop!! !